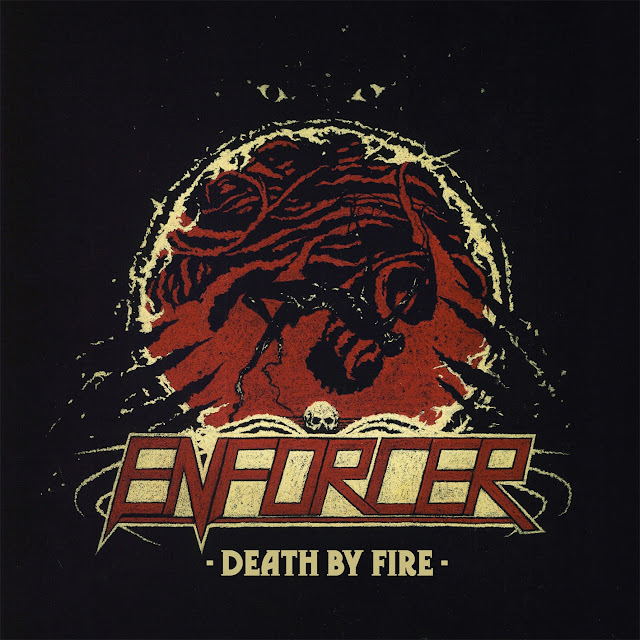 Having seen Enforcer in an explosive live performance and also, having nearly melted their first two albums, I was more than honoured to do a review on their upcoming third album entitled “Death by Fire”. At first I was expecting something similar to their first two albums, which are both masterpieces of classic Heavy Metal. Well, nothing could be further from the truth. “Death By Fire” grabs you from the throat from the very beginning and won’t let go until you’re dead! And Death is what this album is all about, quoting vocalist and guitar player Olof Wikstrand “The album title refers to the most horrific ways to die… all lyrics on “Death By Fire” hold the same theme throughout the record: death - in all different shapes.” The record starts with a small instrumental keyboard piece called “Bells Of Hades” which kind gets you in the mood for what is about to follow. Then all hells breaks loose! “Death Rides The Night” is a classic bang-all-the-way Enforcer song. “Run For Your Life” has the perfect blend of riffs, melodies and high-pitched vocals that we love in Enforcer. “Mesmerised By Fire” is a another classic high energy song with even more aggressive vocals. During the middle of the song, there is a killer part that really adds a lot to the whole mood. “Take Me Out Of This Nightmare” is by far one of the best Enforcer songs ever written. The whole band really giving their best self, their heart and soul really went on this one. “Crystal Suite” is a great instrumental piece, in the style of old Iron Maiden but still, keeping the originality and freshness of Enforcer. The next song is called “Sacrificed” and it’s like the record is starting all over again. Melodies, screams and riffs all mixed together in an actual Heavy Metal Bomb! Along comes the most epic song of Enforcer called “Silent Hour / The Conjugation”. It is the only song that I will not analyse at all, I’ll only say this. It is indeed an EPIC composition and I could easily hear it 100 times in a row and not get tired of it. The record ends with “Satan” (he he he) one of the fastest songs ever written by the band. After all the horror of death that is present in the record, a scream shouting “Satan take me away…” is the best way to end it. The album is less than 40 minutes, in the spirit of every classic Heavy Metal record, from Judas Priest and Iron Maiden, to Slayer and Manowar. It also helps the sound quality in the vinyl format, because when the duration is longer that 19 minutes on each side, the sound is losing it’s quality. That is all folks, keep an eye out for this record when it comes out, it is one of the best Heavy Metal albums of this year. Download is a substitute, support real music and buy some records!